Janice Vaughan Snow was not a reluctant debutante. She accompanied her husband, pioneer aviator Crocker Snow, for more than a half-century, including their honeymoon flight to Cuba in 1938. She accompanied her brother, Norman Vaughan, to several Iditarod Sled Dog races in Alaska. She was also an accomplished equestrienne, who won the prestigious Mortimer Hunt Cup Steeplechase at Bradley Palmer State Park in Topsfield in the early 1950s. Mrs. Snow, a Boston debutante in the 1920s who served as a volunteer nurse and plane spotter during World War II and was cochairwoman of the Republican Town Committee in Ipswich from the mid-1970s to the late 1980s, died April 3 of pneumonia at Beverly Hospital, two weeks prior to her 100th birthday. Last January, at a sled dog race at the Myopia Hunt Club in Hamilton held in memory of her brother, Mrs. Snow presented the Norman Vaughan Prize to the winning team while relating to the gathering her initiation to the sport decades earlier at Vonmere, her family’s estate in Hamilton. Mrs. Snow’s brother, who died at age 100 in 2005, left Harvard University to accompany Admiral Richard Byrd on his expedition to Antarctica in the late 1920s. At age 88, he returned to climb the mountain named after him 70 years earlier. 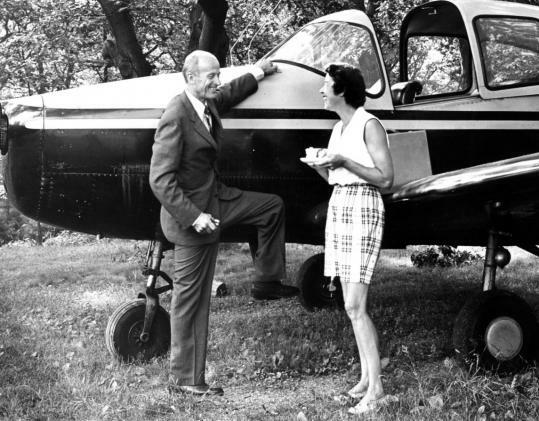 Crocker Snow, her husband of 55 years who helped inaugurate commercial air travel in New England and who received Massachusetts Pilot License No. 5 in 1927, died in 1999 at age 94. During World War II, Colonel Snow organized the North Atlantic Ferry Command and later was wing commander of the first mission of B-29 bombers over Japan. He recalled his courtship with Mrs. Snow in his autobiography, “Log Book: A Pilot’s Life,’’ published in 1997. The couple met at a dinner party in Boston in March 1936 and were married in May 1938 after Mrs. Snow’s divorce from her second husband, Englishman John Douglas Little. Snow, former chairman of the Federal Aviation Advisory Commission, flew a single-engine North American Navion he bought in 1947 until 1998 while logging more than 900,000 miles. He enjoyed taking his wife and family on excursions that began and ended on a landing strip at his Ipswich home to the ski slopes of New Hampshire, the islands off Cape Cod, and on cross-country business trips. Born in Salem, Mrs. Snow was the daughter of a prosperous North Shore shoe manufacturer, George Cutts Vaughan. He invented a process for dyeing leather the color white for nurses’ shoes, patented as Vaughan’s Ivory Sole Leather. She attended the Winsor School in Boston and the Ethel Walker School in Simsbury, Conn., and was married after her debutante year in 1928 to Grafton Smith, who died in an automobile accident in 1930. She married Little five years later and resided in England. Her divorce from Little in Reno and rumors of her upcoming marriage to Snow made headlines in the society-conscious Boston newspapers of that era. The couple was wed in Falmouth Foreside, Maine, and they lived in Buzzards Bay and Boston before moving in 1948 to Ipswich, where Mrs. Snow resided until her passing. Mrs. Snow preferred to be called Mrs. Crocker Snow. A member of the Vincent Club of Boston and the Junior League, Mrs. Snow was well known at Myopia for her riding skills (sometimes sidesaddle) and as a whipper-in, a duty that entailed keeping hounds under control at fox hunts. A genial party giver who was called Nana by her family, Mrs. Snow enjoyed bringing people of all generations together at her home. A parishioner for almost 90 years at Christ Church in Hamilton, Mrs. Snow worshiped most recently at Christ the Redeemer Anglican Church in Danvers. In addition to her son, Mrs. Snow leaves another son, Donald Little of Ipswich; a daughter, Patricia Moseley of South Hamilton; nine grandchildren; and 14 great-grandchildren. A private funeral service will be held Saturday on her birthday, April 17 , at Christ Church in Hamilton. Friends and acquaintances are invited to a memorial celebration at 4 p.m. that day at Mrs. Snow’s home for more than 60 years at 126 Topsfield Road, Ipswich.